Cordless, battery-powered and very lightweight. No computer needed to scan! 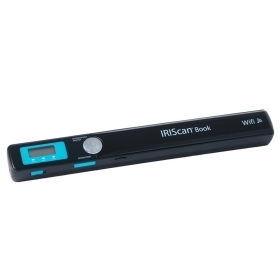 IRIScan Book Executive 3 is an extremely compact scanner that fits easily in your laptop bag or in a drawer. Its four AAA batteries and the memory card will allow you to scan all your documents without being connected to a computer. Whether you're at home, at the office, in a customer meeting or sitting in your couch, your IRIScan Book Executive 3 will follow you everywhere! Transfer documents using Wifi or USB to ANY device! The brand new IRIScan Book Executive 3 includes Wi-Fi that allows you to transfer all your images instantly to your computer (Windows or Mac), smartphone or even tablet (iOS or Android). The free IRIScan Book App available on Apple’s App Store and on the Google Play store (previously Android market) connects your iOS or Android device to your IRIScan Book Executive 3 quickly and easily. The scanner has its own wireless network to transfer the images, it doesn’t require any configuration or an Internet connection. Once back at your desk, you can also transfer your documents via USB by using the provided cable. You can download your scanned images or even scan other images directly to your computer through the USB cable. IRIScan Book Executive 3 comes with a fully-functional OCR application (Readiris) that allows you to convert text zones from your scanned documents into fully editable Word, Excel or PDF documents. Your files will be converted and ready to be edited, archived, or even shared with the automatic export to a Cloud-based solution such as Dropbox, Evernote, Google Drive, etc. The included Readiris allows you to convert scanned documents into fully searchable PDF files thanks to its powerful OCR engine that turns the text included in an image into text that can be searched. Now finding the information contained in a document is just a quick search away, and you won’t ever have to spend long periods of time reading the whole text! The new IRIScan Book 3 includes a button which allows you to choose PDF or image files (JPEG) as scan format. You can also choose the resolution (300 - 600 or 900 dpi) and quality (color or black and white) and you can edit your settings directly from the scanner, without having to connect it to a computer.